The original leases and recited leases show that eleven houses or sites mentioned, seven were probably built or developed by Thomas Lucas, and his will implies that he built another thirteen. Four were definitely by other craftsmen, two by the bricklayer, John Bone of Deptford, one by the masons Reyalls and Pearce, and one more apparently by Pearce alone. Lucas was building on his own account from first to last. Although described as a bricklayer, it is not quite clear where he physically built any of the houses himself. It is clear from the quantity of work on which he was engaged, especially after 1713 when his contract on the new church began, that he would have been forced to employ craftsmen to work under him. In fact his time would have largely been engaged managing the development rather than physically building it. The craftsmen whom he employed, bricklayers, carpenters, and joiners remain anonymous, as so does the carver of the brackets supporting the hoods to the doorways. The three craftsmen known to have taken building-leases are known only by name and have not been found elsewhere. One or two other contemporary craftsmen are connected with Union Street if only tenuously. First is Matthew Spray who died in 1742 bequeathing his house in Union Street to his wife, Martha, who occupied it until 1755. 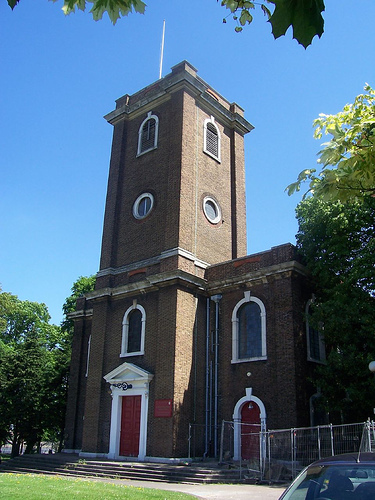 Spray, a bricklayer, built the church of St Mary Magdalene, Woolwich, between 1727 and 1739. One could speculate that his house, No. 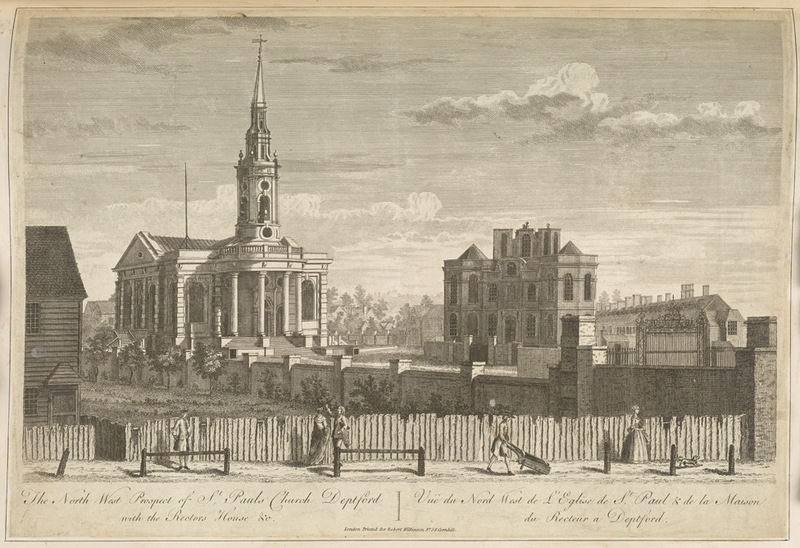 4 Union Street on the North side and one of the smallest in the street was given to him by Thomas Lucas in lieu of wages for his work in Lucas’s employment on Union Street and the church of St Paul. At all events, Lucas had disposed of his house and the freehold of the land on which it stood presumably to Spray, by the time he wrote his last will in 1734/5. Another Deptford bricklayer, Nathaniel Carter, appointed Thomas Lucas and his wife as the executors of his will, but the will has not been found and nothing more has been discovered about Carter. 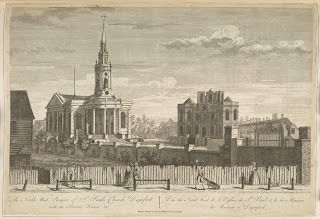 For other craftsmen employed working on Union Street, one may speculate amongst those who, like Lucas, worked under Thomas Archer on the new church. James Grove, a carpenter, and John Gilliam, a joiner, both of Greenwich might have assisted Lucas. Grove was appointed carpenter only three weeks after Lucas was appointed bricklayer, and worked closely with him providing for instance centering (Turning Pieces) for the brick arches of the crypt. Gilliam, who made the alter piece, pulpit, reader’s desk and clerks desk for St Paul’s Deptford, should be considered as the maker of the carved brackets on the Union Street doors, but there is no evidence to support the theory. Tradition has it the brackets were carved by ships’ carpenters but there is nothing specifically nautical about them. The carving is of high quality and of a type which appears in churches of that date. Financing the building of Union Street must have been a complicated proceeding for Thomas Lucas. Having satisfactorily mortgaged his land, his most expensive items were materials and labour. In 1706, he is recorded as having a tile kiln and in 1713, as bricklayer for the new church he was, initially at least, responsible for the supply of bricks. The bricks probably came from a local field but it is not known who may have owned it. Even if Lucas acted as his own supplier, he still had to pay for labour, both for brick makers and for bricklayers, and although he must have at least partly paid for them in money, he probably paid them partly in kind. He had adjacent to his own house at the south west corner of Union Street, and lying behind the street, a Malt House. It abutted the rear of the public house known first by the sign of the Swann’ and later as “The King of Prussia” a building that Lucas never sold. Beer must have appeared large among his payments in kind to his labourers. But its is also significant that Lucas’s daughter, Sarah was married to one Thomas Cells of St Paul Deptford, a shipwright but more often described as a distiller, and he inherited from Lucas an interest in the malt house, so one may surmise that gin as well as beer may have helped pay for the labour. It ahs already been suggested that Lucas may have given Matthew Spray, the bricklayer, a house in Union Street in return for work done by Spray for him. The possibility of Lucas building a house and exchanging it for materials arises since as early as 1706 the lease hold of two houses on the north side of Union Street was owned by Elias Wood a lime burner. Wood paid Lucas twenty four shillings per annum ground rent and while this small sum of money was probably paid in cash it is likely that the purchase price of the house may well have been paid in supplies of lime for making mortar. Part 4 extract from A Quiney's paper on Albury Street 1979. I am re-enactor with the Renaissance Pleasure Faire in California, and our "town" is supposed to be Deptford in the early reign of Queen Elizabeth I. While collecting research information for a proposed lesson plan I came across your blog which is quite the windfall for me! If it is not a bother I am greatly interested in the traditions and people of Deptford in the 16th century. As much as I search, until I came upon your site I found little to nothing. Any information or leads would be greatly appreciated! Thank You and please continue with this fantastic site.